The Annual Ahr Star Easter Egg Hunt took place on Wednesday, April 10, 2019. The night before, the Easter Bunny visited Bishop Ahr High School and left big footprints outside some of the classrooms. Mikey Lucas and Ellona Grazziano, this year’s Ahr Stars, came to BGA looking for the footprints, eggs, and other treats that were left in the classrooms by the Easter Bunny. 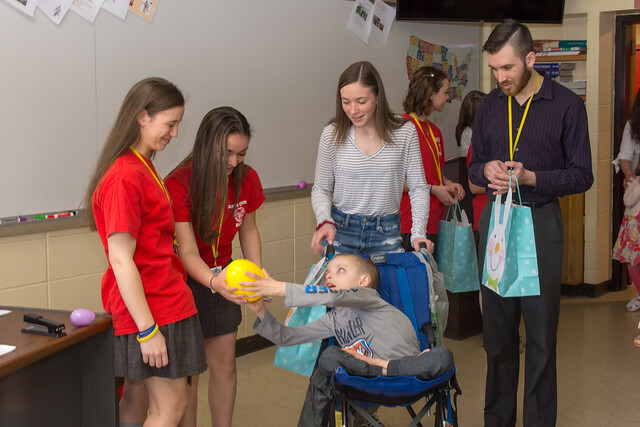 They were led around hunting for the Easter eggs by the Ahr Star representatives Joseph Dunn ’20, Bethany Ciccarelli ’20, and Ahr Star Board Members Tina Raspa’20, Katie Wilson ’20, Alyssa Pittari ’20, and Nihaal Walia '21. The Ahr Star reps and board members assisted the Ahr Stars and their families to the rooms that the Easter Bunny had visited. Lots of fun-filled, colorful, big, and silly eggs plus lots of candy, money, stuffed animals, and toys were found by Mikey and Ellona. The Easter Bunny even left eggs for their siblings llyana, Kylie, Tommy, and Ryan. At the brunch reception, everyone had fun playing basketball, sharing funny stories, and enjoying the food. Each Ahr Star family also received a $1,500 check to be used for whatever they need! Mikey, Ellona, and their siblings left with fun-filled Easter Baskets, a tray of Roche Cookies and lots of little treats after having had an awesome time!